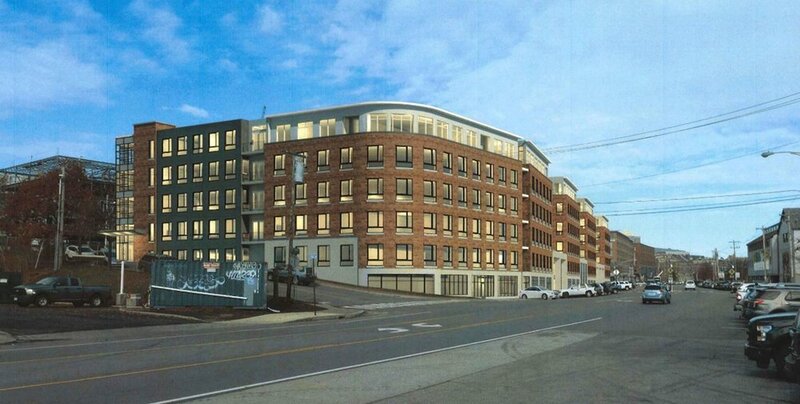 The design team working on the redevelopment of the Rufus Deering parcel has submitted revised images of their proposed plan for a mixed use development at 383 Commercial Street. The new design responds to many of the comments made by members of the Portland Historic Preservation Board at a workshop in January. The role of the Historic Preservation Board is advisory only to the Planning Board because the project is just outside the boundaries of the Portland Waterfront Historic District. The Historic Preservation Board will hold a second workshop on the project on March 1 at 5:00 PM in Room 209 of City Hall, 389 Congress Street. Sen. Susan Collins and five other senators have introduced the Historic Tax Credit Improvement Act of 2017 (S.425). The bill would increase the historic tax credit (HTC) for certain small projects, allow credit transfers for certain small projects, lower the expenditure threshold to qualify for the HTC from 100 percent to 50 percent of the adjusted basis, reduce the depreciable basis adjustment for HTC property, and modify certain tax-exempt property rules. Several members of the House of Representatives introduced a companion bill in their chamber. For more than three decades, the federal Historic Tax Credit (HTC) has successfully implemented a national policy of preserving our historic resources. It is the most significant investment the federal government makes toward the preservation of our historic buildings. Despite a proven track record of stimulating economic growth and preserving our architectural heritage, however, the historic tax credit faces an uncertain future. As pressure builds to reform the nation’s tax code, several influential tax reform proposals recommend a repeal of this essential credit. We appreciate Sen. Collins' sponsorship of this bill and her support for the redevelopment of Maine's historic resources. Please join us in thanking Sen. Collins by email or with a thank you note or postcard via mail at One Canal Plaza, Suite 802, Portland, ME 04101. Thank you Senator Collins for sponsoring the Historic Tax Credit Improvement Act (S.425) and for your continued support of a program that has proven to be a cost-effective driver of economic development and job creation while conserving our nation's historic places. More information on the Federal Historic Tax Credit is available here. Greater Portland Landmarks letter to Senator Collins is available here. The latest draft plan is based on work that began in 2015 and included a process of extensive public engagement, including attendance at farmers' markets, fairs, middle and high school classes, neighborhood group meetings, and many other events to learn what people in Portland hope for the next 10 years. In all, city staff have attended well over 40 events this year, hearing from hundreds of people, as well as countless others who stopped by at large events. Landmarks' Advocacy Committee met with city staff last month and members and staff have participated in public workshops and other events throughout the process. Landmarks' believes that Portland's historic character is a critical element in our city's authentic sense of place and therefore is important to conserve and enhance as we chart Portland's future. The conservation of our built environment is also critical to helping move our city forward as a more sustainable place to live and work. Our historic buildings support businesses large and small and provide a diversity of housing options for Portland's residents. Through support of the City's Historic Preservation program, cultural organizations that promote the City's history, and the many businesses that contribute to Portland's heritage tourism industry, Portland in 2030 can be equitable, sustainable, dynamic, secure, authentic, and connected. The final scheduled public hearing will be the Planning Board's meeting December 20, 2016, 7:00 p.m., Council Chambers, City Hall. If you are interested the last Planning Board workshop on the project's Architecture and Public Amenities it is available online. There is a brief discussion on the process and what a master development plan is and is not, a presentation by the applicant, public comment, and a discussion by board members. Portland's Planning Board and Historic Preservation Board have been holding workshops this month on CPB2's application for a master development plan at 58 Fore Street, the former Portland Company site. A final workshop on the project's public amenities and architecture will be held tomorrow afternoon at 4:30 in City Council Chambers. The Historic Preservation Board will hold its public hearing on the proposed plan on December 7th and the Planning Board will hold its public hearing on the plan on December 20th. More information on times and locations tbd. At the request of board members, CPB2 has provided additional images of the proposed development. The next public meeting for the Congress Square redesign is a month away. The design team WRT and artist Sarah Sze will present the latest design concepts for the square and public art. The presentation is open to the public and public comment will be taken. The city and the design team want to hear your feedback! On November 12th the City of Portland will hold a public forum on its ongoing Comprehensive Planning. The Comprehensive Plan is a long-range policy document that establishes a vision for the city for the coming decade. It addresses such topics as historic resources, housing, transportation, natural resources, open space, the economy, and more. The City of Portland's Planning Division invites you to come hear preliminary goals and recommendations of the plan and to tell them what you think. Vacant for several years, the City has been working with developers and neighbors to find a new use that is compatible with neighborhood goals and economically feasible. Developers Collaborative, the developers responsible for the successful adaptive reuse project for the former Nathan Clifford School in Deering's Oakdale neighborhood have developed a plan to reuse the Reed School as a pre-school for special needs students. Read more about the proposal here. Woodfords Corner in the News! The Independent Order of Odd Fellows' building is an architectural landmark on Forest Avenue. The Odd Fellows continue to serve as outstanding stewards, maintaining the large masonry structure designed by Francis Fassett in 1897. The building has served as the Odd Fellows Hall, a Masonic Temple, Deering's City Hall, a school for neighborhood students, and a host of commercial tenants in its 120-year history. The historic building is even more impressive with the recent restoration of the clock tower. Read more about the Odd Fellows and the clock tower project in a recent Portland Press Herald Article here. Make your voice heard and help the Public Art Committee decide which of three sculptures should be located in a new park in front of Odd Fellows Hall. The comment period closes August 26th. For more advocacy updates, visit the Ongoing Issues page.